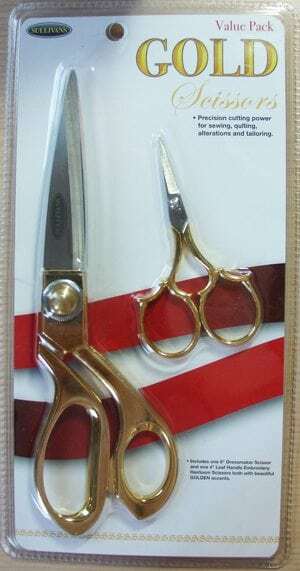 Here is a combo-pair of scissors that will meet all your cutting needles; whether your cutting fabric, making alterations, or just snipping threads. Precision cutting power for needlework, sewing, quilting, alternations and tailoring. Handles designed for natural, comfortable hold with excellent control while cutting. Includes one 8″ Dressmaker Scissors and one 4″ Leaf Handle Embroidery Heirloom Scissors. Both with beautiful shiny gold handles and stainless steel cutting blades.